YEREVAN — Armenia marked the 100th anniversary on Friday of a mass killing of Armenians by Ottoman Turks as Germany became the latest country to recognize it as a genocide. Germany's parliament approved a resolution Friday branding the killings a "genocide," risking a diplomatic rupture with Ankara in a significant change of stance for Turkey's biggest trade European Union trade partner. The European Parliament refers to the killings as genocide, as did Pope Francis this month. The U.S. has refrained from doing so. Turkish President Tayyip Erdogan as recently as Thursday refuted the description of the killings as genocide. 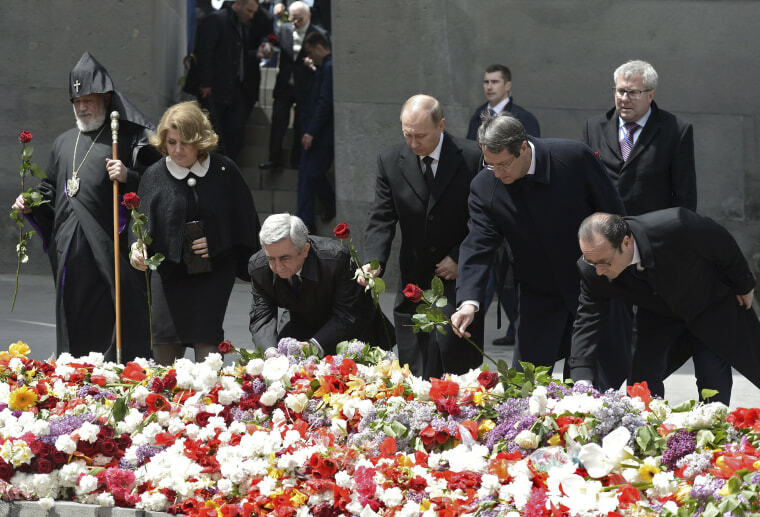 The French and Russian presidents, Francois Hollande and Vladimir Putin, were among guests Friday at a hilltop memorial near the Armenian capital Yerevan and led calls for reconciliation. "Recognition of the genocide is a triumph of human conscience and justice over intolerance and hatred," Armenian President Serzh Sarksyan said. In a speech at the ceremony that was met by warm applause, Hollande said a law adopted by France in 2001 on recognition of the killings as genocide was "an act of truth."